In recent coverage about how the feathers in hair craze took over the floor at Premiere Orlando show, I told readers how I was on a mission to see if these feathers I got from Fancy Feathers of BlingStrands could be somehow curled to match more tightly coiled hair textures. Chances were looking pretty good that I could get it figured out considering the fact that I was surrounded by more than 20,000 professional stylists. 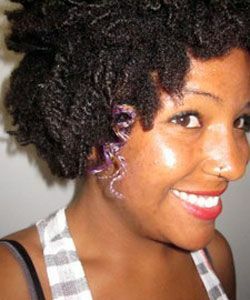 After a lot of walking around and looking for a perm rod or a vendor specializing in straw sets, I went back to the hotel with a curl-less feather hanging from my coils. Then at dinner that night, someone gave me a hot tip on a vendor I had NOT considered: Doll. 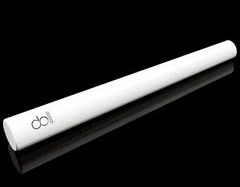 Doll is a recently launched UK-based company that sells a product called the Twiddle Stic. The Twiddle Stic is a long, cylindrical rod that uses ceramic heat technology to create perfect spiral curls. There are three sizes of the Twiddle Stics available and after watching a few styling demonstrations at their booth (on both models and show attendees), I was confident that the Twiddle Stic was the way to go for Operation "Curl My Feather". The look is understated, but definitely adds some colorful flair to my coily fro! The moral of the story: feathers are not just for people with straight hair, so hop on in, curlies! The water is fine! At first, the Doll stylists peered up at my coils with confusion when I approached them and asked them to help me out. But when I pointed to my feather, they understood and grabbed their smallest Twiddle Stic, which measures 10mm in diameter. Within 30 seconds the curling was done. I looked in the mirror and voila: a perfectly coiled feather! The coil of the feather is a bit larger than my own coil diameter, but it blends in quite nicely.